My personal Bible study has taken me to the book of Job. I’ve been feeling a little like Job lately, and have always wondered what in the world am I supposed to do with those 30-some chapters between the stage-setting beginning and the divine resolution in the end. The question still troubles me since about half of that middle material is still supposed to be understood as bad advice. But here too is where it gets interesting. Job is wisdom literature. Wisdom literature refers to that genre of Scripture dedicated to the mysterious but desperately needed proficiency between the black and white letters of the law. To understand wisdom literature it helps to contrast it with the equally instructive genre of law. It is not the same genre as law, but neither are these genres enemies. They might be thought of as brothers with different points of emphasis. There are no “ten commandments” of wisdom literature, as that would blur the firm specific demands of law with the fluid contextual principles of wisdom. Wisdom is not so much about “what to do” as it is about how best to do it. It is not just about the right ends but also about the right means. A biblically well-rounded person will be obedient to and versed in the law, but also wise in how he goes about applying it. Wisdom might be thought of as the art of living, and law as the science of living. Wisdom is the skill for navigating the gray areas in life; law is the judgment between the black and white areas of life. Wisdom gives general principles, law gives commands. Both elements are indispensable for righteousness. I think the hardest thing for Job to handle, though, is that God seems distant. God has raised his hand against Job without any answer as to why (Job 12:10). God’s justice seems distant–hence the wicked prosper and the righteous suffer (12:6, 21:7, et al). God doesn’t (yet) answer Job’s distraught prayers, though Job remembers when God used to answer him (12:4). Without any answer from God nor any account in God’s court, Job’s suffering is meaningless agony, wasted pain without redemptive purpose. Job desperately wants relief, but he’s at least as concerned to see his fellowship with God restored. Job cries out because God seems to have abandoned Him, without even a goodbye letter. That kernel in Job’s cries is entirely justified. It is in this context that the “wisdom” status of this book takes on a unique light. As with other books of wisdom literature, (1) wisdom is characterized as mysterious, “but wisdom–where can it be found? Where is the place of understanding? Mankind does not know its place; it cannot be found in the land of the living” (Job 28:12-13). It is not found in conventional places, and it’s elusive enough to be overlooked. People who claim to be wisdom are not often so. Job does not claim to be wise, but neither do his friends seem so either. (2) Wisdom is of inestimable value. No gold or silver or precious jewels could have been traded for it. It is beyond value (28:15-19). For Job this fact means that all his suffering might still be worthwhile if he gains wisdom from it. (3) Wisdom is not so much an “arriving” as a “pursuing.” Chapter 28 continues with Job describing a worldwide investigation into the whereabouts of wisdom. He states how the deep does not contain it, nor the sea engulf it. The birds do not know where it is (28:21). Yet interestingly, in 28:22, Job says, “Destruction and Death say, ‘With our ears we have heard a rumor about where it can be found.” Akin to Ecclesiastes, the book of Job seeks wisdom amidst existential crisis. Job’s horrible conditions might possibly be worthwhile since his proximity to death and destruction give him some hint of that elusive wisdom. 4) Wisdom is found in God alone. In the next verse Job turns to say, “God understands the way to [wisdom] and he alone knows its place. For he looks to the ends of the earth and observes everything under the heavens.” God being master of all knowledge is the sovereign director of all things. He created all the operations of the earth and it is man’s role to discover those ways and align with them (28:24ff). That is wisdom, skillful living. God has grounded all wisdom, and by pursuing God man approaches that sacred ground. In Job’s terms, man arrives at wisdom by fearing the Lord, “the fear of the LORD–that is wisdom, and to turn away from evil is understanding” (28:28). 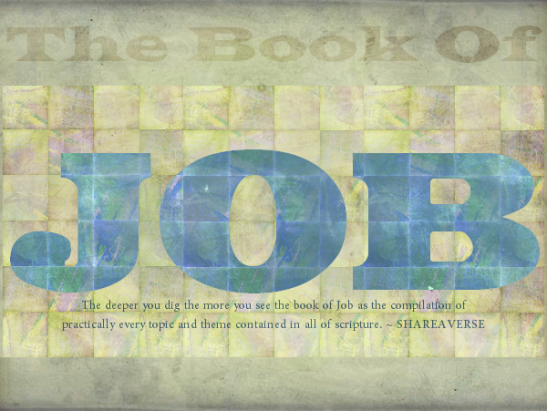 The book of Job is genuine wisdom literature. It is other things too–a theology of suffering, a historical narrative, ancient literature–but it is also a story of one man’s pursuit of wisdom. We can glean wisdom for living by understanding his story, his travails, and how God never left him, even when the answers weren’t forethcoming. God does arrive in the end, and the end proves far greater than the beginning. Yet we are in the in-between, there with Job, crying out to God for answers to our hurts and harms. To carry this point further, simply pleading with God is not itself the heart of wisdom. Only when our pursuit of God is to “fear the Lord” are we beginning in wisdom. Fortunately, we can desperately pursue God, craving His fellowship, needing His answers, longing for His favor even as we revere His Holy name. Job’s message to us is not quite as “romantic” or buddy-buddy as our contemporary Gospel expressions might prefer. Job does not say, “the love of God is the beginning of wisdom.” Job’s sufferings cannot be redeemed if God were just a pleasant happy hippy. Our God, Job’s God, is also the rightful judge of the universe. God is to be feared. Yes, He is to be loved, but also to be feared. God is not a “tame lion” (C.S. Lewis). And we aren’t loving the true God if we love a non-judgmental, passive, sin-accommodated Divinity excusing just about anything for the sake of having his friends near Him again. That is not God but an idol (i.e., Buddy Jesus, or Moralistic Therapeutic Deism, etc.). God’s love for us is fierce and jealous. His plan of salvation is audacious and amazing. He wants us all to Himself. And He wants us to become something different from what we were, to change us from the inside out. In Job’s story, he never seems to question whether God has the right to do what He wants, to issue pain and punishment as He sees fit. Job seems to trust that God has His reasons, but Job is dying to hear even some of those reasons since this pain seems a lot like punishment and he can’t think of anything he’s done to deserve this. Job is indeed wisdom literature. As we read this book, we too might take a heartening look at our own lives. Job says that destruction and death have heard the rumors of where wisdom is found (28:22); no other natural phenomenon is like that. All other realms of nature are ignorant of wisdom. The author of Ecclesiastes concurs, “the heart of the wise is in the house of mourning” (Ecc 7:4). I do not think Job is celebrating death or destruction as such. He is not morbid, though he is melanchonic. He is saying, I think, that we should be contemplating the brevity of life, reckoning upon our own mortality and deep vulernability, feeling the weight of human sorrow, for somehow in that punishing position our human hearts are softened enough for wisdom to take root and sprout. It’s blossom is clear when men obey the Lord, the evidence of understanding. Job learned a new level of “fearing the Lord,” and the Lord, and the fear of the Lord is the beginning of wisdom.